Your Memories is a short experimental film shot and edited by Nicolettecinemagraphics’ Nicolette Swift in 2014. The film explores how the stories we hear from others about events and places creates memories of our own that harness ancillary meaning and control our engagement with those events and spaces for the rest of our lives. This just under two minute film is a combination of styles including site specific documentation with Nicolette’s personal essay mode. The end result accompanied by a wax cylinder musical recording, creates layers of time and space on the screen and in the mind of the viewer as they imagine similar places that occupy their own memories. 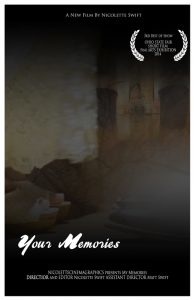 Your Memories from Nicolettecinemagraphics on Vimeo.